Halloween is coming – and so is the fun! Everyone wants to win the prize for creepiest costume and the most frightening yard décor in the neighborhood. But all that spookiness comes with a scary price tag. The average American will spend $169 on Halloween costs this year. And, if that’s not enough to terrify you, consider this: Most people spend close to $70 just on their costumes. That’s a lot of money for something you likely won’t wear again. Ready to save big? 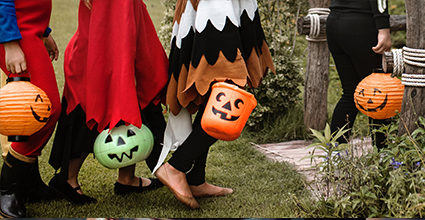 Read on for 7 money-saving hacks for Halloween that are just too good to miss. From DIY décor that will scare the living daylights out of your guests to effortless costumes that look great without costing a bundle, we’ve got you covered. 1) Is that real ketchup? You’re all set – now go scare someone silly. 2) Whose hand is floating in the punch bowl? For a ridiculously easy costume that will make people laugh, go as a stick person. Don’t forget to do the stiff stick-walk and you’ll really crack people up. 4) Is that a witch sticking out of your snake plant? Now sit and watch your visitors’ reactions and you’ll have the last cackle. 5) Would you like some spiders with that? 6) Did you really just kill a box of cereal? Take an old white T-shirt and decorate it to look like your favorite cereal box. Then take a fake dagger and carefully cut off its tip. Glue the blunted dagger to the middle of your cereal box so it looks like it’s piercing it right in the heart. Then use your fake blood to add splatters and drippings all over your shirt. Make your face look menacing with some dark costume makeup and add an ominous scar across your cheek, too. You’re ready to hunt down those no-good cereals. 7) Anyone care for some fresh worms? Serve up an entrée from the dark side that will have your guests completely grossed out. Don’t let Halloween costs scare you. Follow our hacks for a frighteningly fun time that won’t kill your budget and will still terrify the entire neighborhood.